Don’t Mourn Atticus Finch A fictional hero turns out to be as complicated and flawed as the real ones. 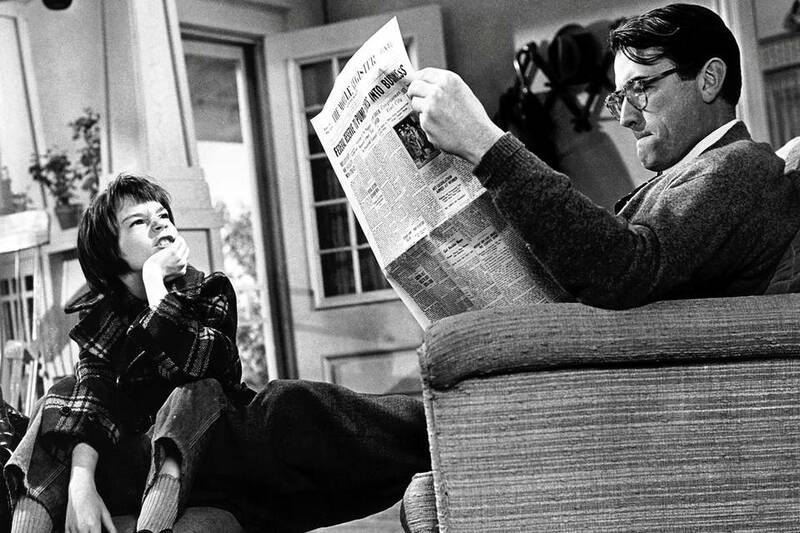 Scout (Mary Badham) and Atticus (Gregory Peck) in ‘To Kill a Mockingbird’ (1962). I’ll never forget reading that scene as a child and how my eyes pooled with tears. They did again the other day when I reread the book. Boo, the pale hermit next door about whom the neighborhood children had spun gothic tales of derangement, was suddenly out from the shadows and revealed as a friend. And Atticus Finch, Jean Louise’s father, maintaining his composure on that dramatic evening and seeing to the small courtesies that, he knew, were part of the price we pay to continue civilization . . . But I know how my friend felt. She herself was already launched on a great New York career when “Mockingbird” was published in 1960, and her heroes were those of her day, JFK and Dr. King. But they were human and imperfect. Atticus wasn’t real, so he promised to stay fixed in time and never disappoint. I think part of his power as a figure of literature—as a figure of American life—is that he wasn’t only on the right side, he was on the right side in the right way. He was for my generation the perfect father figure: calm, reliable, full of integrity and always there—the kind of father anyone would want and few would have. Messy life, or at least messy publishing, has now famously intruded, and we have Ms. Lee’s first book since “Mockingbird,” which was set in the 1930s in a sleepy Alabama town. Although written before “Mockingbird,” “Go Set a Watchman” is set 20 years later, after Brown v. Board of Education. And as we know we meet a new Atticus, a racial segregationist. The Atticus of “Mockingbird” was a symbol of the future, a lawyer who believed in equality under the law and defended an innocent black man at considerable personal and reputational cost. This was a story that gave readers something to aspire to. The bigotry in “Watchman” is drawn broadly. The locals speak not only racial slurs but slurs against Catholics and Jews. But it is not without meaning that all of the people quoted speaking this way are portrayed by Ms. Lee as fools—either ignorant and proud of it or unknowingly stupid and remediable. I was unjust in my email to my friend when I called it a bad book, but it is a curious one. It shows the awkwardness, the stops and starts, of the young writer. The protagonist, Jean Louise, is the one we agree with: Segregation is evil and must stop. And yet as a character she is drawn unappealingly, always making long speeches and hurling accusations at those who love her and brought her up. Atticus, now in his 70s, holds views the reader will reject, yet he is patient, sincere—more human as a character than his daughter. Sometimes as I read I thought: What was Harper Lee up to? At the end Jean Louise realizes that her anger in part arises from moral displacement. All her life her father had been a person of unquestioned rectitude, and her admiration was such that she never quite developed an independent conscience of her own. Faced with a quandary she’d ask “What would Atticus do?” Now in the America of the 1950s, she would no longer be able to outsource her sense of right and wrong. She would have to grow up. And so, the book implies, would America. So is the old Atticus gone? Are we bereft of a national hero? No. If every time “To Kill a Mockingbird” plays on TV and a child sees it, or a child is moved by the book, someone helpfully points out that “Atticus was a racist,” it would be sad. Children’s hearts shouldn’t be made heavy. Reality will assault them sooner or later, but it’s good when you’re young to be inspired by dreams. They make you strong. In any case it seems to me the South has produced some new heroes recently, and they’re not made-up but real ones. The relatives who forgave the killer in Charleston and who wept as they told the suspect they were praying for his soul, and who meant it—you don’t get any better and braver than that. And the people who, after witnessing that moment, took the Confederate battle flag from public grounds . . .
Atticus never lived and can never die, and if you want to visit him you can pick up a book. America is an interesting place and we don’t have to look to fiction to be inspired.